I’ve upgraded to OS X Yosemite on my MacBook Air and I mostly like it. What I don’t like is iTunes 12—I find it hard to navigate. Is there any way I can go back to iTunes 11 and still run Yosemite? There is. And as much as I’d like to take credit for devising the way to do it, that credit goes to Jacqui Cheng, formerly of Ars Technica and now editor-in-chief of The Wirecutter. I mention her former Ars Technica affiliation because that’s where she described the process for downgrading from iTunes 11 to iTunes 10.7. It turns out that the technique works just as well for moving from iTunes 12 to iTunes 11. Download a copy of AppZapper as well as CharlesSoft’s Pacifist. A demo mode in each allows you to perform the following actions, but each is worth owning (and paying for). Make a backup of your Mac and, for good measure, a backup of your iTunes library as well. These are just-in-case measures. Say goodbye to iTunes 12 with AppZapper's help. Quit iTunes 12, launch AppZapper, open AppZapper’s preferences, and uncheck the Keep Apple applications safe option. 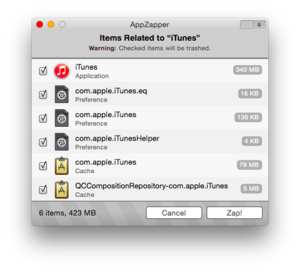 Drag the iTunes 12 icon from the Applications folder into the AppZapper window. Click the Zap! button and iTunes 12 and its associated files will be deleted from your Mac. Your iTunes library will remain, however. Download a copy of iTunes 11 for OS X from Apple. 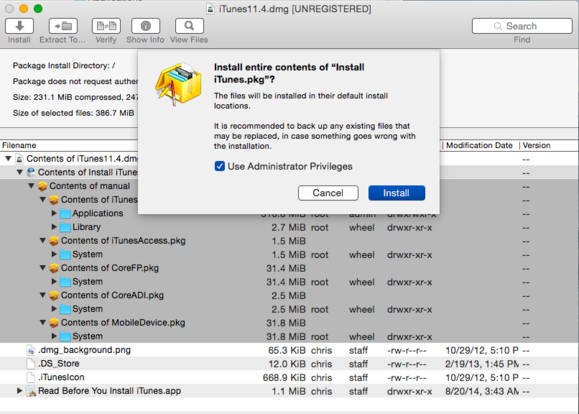 Launch Pacifist and drag the iTunes 11.4.dmg archive on top of it. This will cause an installation window to appear that lists all the components within the archive. Select Contents of Install iTunes and then click Install. Along the way you’ll be asked to replace certain files. Allow this to happen. Pacifist places the contents of iTunes 11 on your Mac. iTunes 11 is now in your Applications folder. When you launch it you may see a notification that the iTunes Library.itl file can’t be read because it was created with a newer version of iTunes. Your choices are to Quit or Download iTunes. Unless you want iTunes 12 back on your Mac, click on Quit. In order to use iTunes 11 you'll need to remove the iTunes Library.itl file created by iTunes 12. Navigate to where you keep your iTunes library (it’s in the Music folder within your user folder by default), locate the iTunes Library.itl file, and drag it to the desktop. Launch iTunes again and it should launch properly (and replace the iTunes Library.itl file with one that’s compatible with iTunes 11). Should you later wish to return to iTunes 12, you can do so via the Mac App Store—it will be offered as an update. Install that update and iTunes 11 will disappear and be replaced with the latest version of the app.